Are you an Independent Care Worker? We give independent carers access to those in need of care. We give those in need of care access to independent carers. Register your services or care needs with us. We will provide guidance and help to find an appropriate match. We would like to see Registered carers in the same way we have Registered Childminders and we are on a campaign to address this issue and introduce an alternative in the care sector. I love the flexibility of hours, we can work out mutually acceptable hours/days that work. I love building up and having a good relationship with my client and their family. 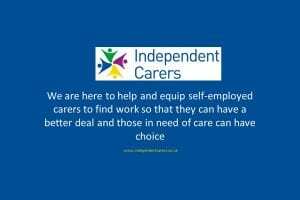 I love freedom of being an Independent Carer, able to look after someone you want to look after, having a great relationship with them and getting paid a reasonable rate for doing it. I prefer to work independently because it means there are less time constraints, for example, if I need to stay longer with my client. I can be in charge of my own time, we fit in around each other and it works.